This post was sponsored by Tree Top, a cooperative of growers who take excess and unattractive fruit to make tasty and delicious beverages like the Tree Top 100% Pure Pressed Sweet & Tart Apple Cider featured in this recipe! Reducing food waste is something that matters to me, so I'm very appreciative of companies like Tree Top who find innovative ways to do so. As always, all thoughts and opinions are my own. Thank you for supporting Hummingbird High and my awesome sponsors! One of my secret shames as A Big Deal Food Person is that I don't really eat breakfast. It's a bad habit left over from the days I worked in corporate and I rushed out the door straight to work, only eating my first meal at lunchtime. Although there's always been competing evidence as to whether or not breakfast is good for you, I'd like to believe it is and often wish I remember to make the time for it daily. I've always liked the idea of sitting down and treating yourself to a quiet, nourishing meal before the rush of the day. Unfortunately, when life gets busy (like it tends to do so at this time of year), I quickly revert back to my harried, non-breakfast eating ways and inadvertently end up starving until lunch time. 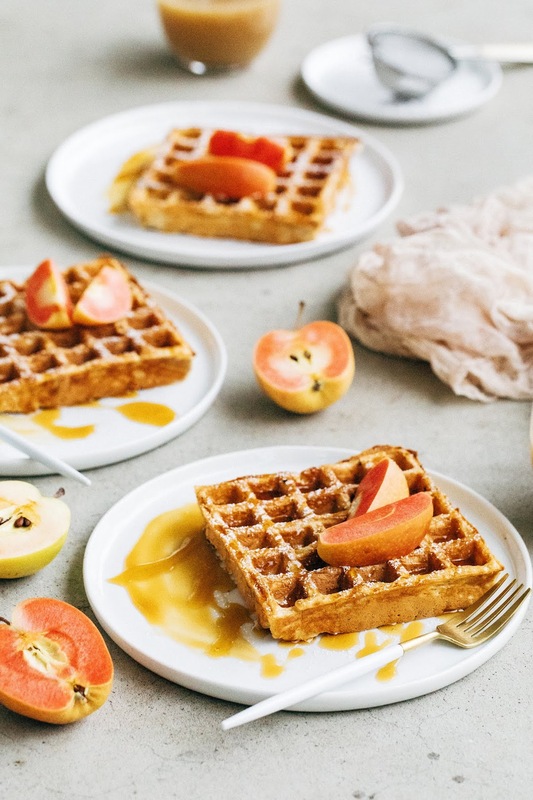 Which is why I think it's really funny that the last few recipes on my blog have been breakfast oriented: pumpkin croissant French toast, chocolate potato chip donuts, and now, these apple cider waffles. It's almost like I'm compensating for all those times I skipped breakfast and forcing myself to do so by developing breakfast recipes for the blog, ha. The recipes are big and decadent, resulting in dishes that are more suitable for indulgent weekend brunches than quick breakfasts before work. They're full of bold flavors too, the kind that warm your heart during these cold winter months. 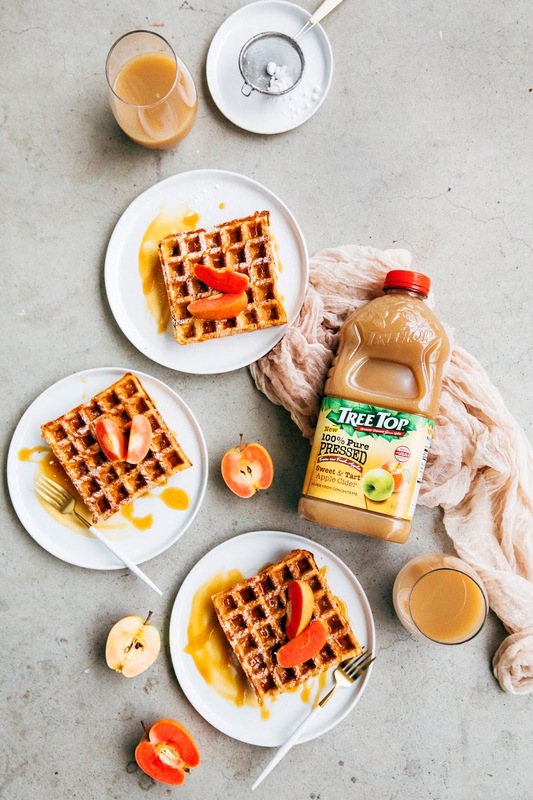 These buttermilk waffles, for instance, get a big dose of flavor from Tree Top 100% Pure Pressed Sweet & Tart Apple Cider. The cider is plenty flavorful on its own since it's made with real Granny Smith apples (no concentrate, baby!) and is currently the only premium pure pressed "sweet and tart" cider currently on the market. 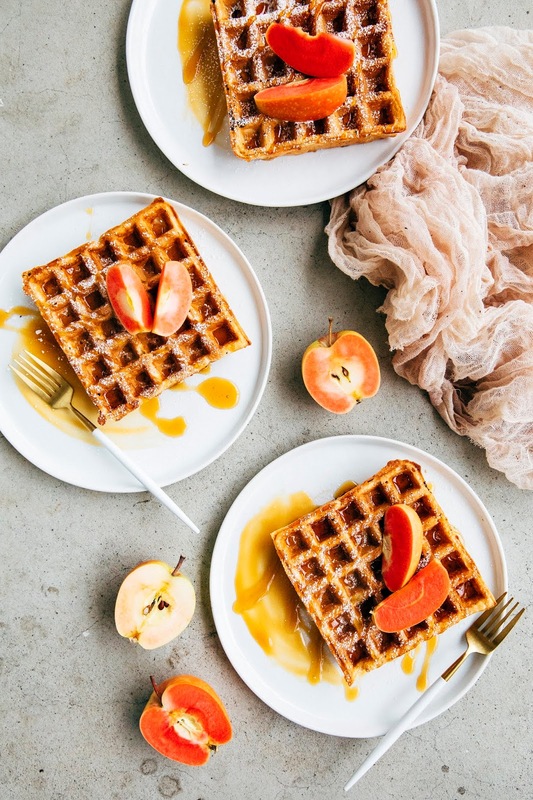 To make my waffles extra flavorful, I reduced a generous quantity of the cider to use in the batter — doing so created an ultra-concentrated apple cider syrup that is sweet and tangy. Enjoy! To save time, you can reduce the Tree Top 100% Pure Pressed Sweet and Tart Apple Cider up to 3 days in advance. Once reduced, simply pour into a small mason jar with a lid and refrigerate until needed. If you're strapped for time, you can just use 3/4 cup of apple cider without reducing it, but I don't recommend doing so — the apple cider flavor will be mild and will get lost within the rest of the ingredients. Reducing the apple cider is the way to go! This recipe is a little fussier than your average waffle recipe since it calls on you to beat the egg whites into soft peaks and fold them into the batter; doing so results in incredibly light and crispy waffles, the kind you get at your favorite brunch place. In a pinch, you can skip this step and just whisk in whole eggs with the rest of the wet ingredients, but your waffles won't be as next level. The yield of the recipe will vary depending on your waffle maker; I used Breville's 2 Slice Waffle Maker (which I love, love, love), whose cavities require a whopping 1/2 cup of batter to make a single waffle. If your waffle maker doesn't use that much batter per cavity, you'll end up with more waffles than I did. Combine 2 1/2 cups Tree Top 100% Pure Pressed Sweet and Tart Apple Cider and 1 cinnamon stick in a heavy-bottomed saucepan. Place over medium-high heat and bring to a boil; continue cooking until the cider is reduced to 3/4 cup (6 ounces). The entire process will take around 15 minutes — check how much liquid is reduced every 5 minutes or so by pouring the cider into a liquid measuring cup. Don't worry if you accidentally reduce the liquid too much — you can always top off with more cider. Once the cider is reduced, pour into a liquid measuring cup. Fish out the cinnamon stick and discard. Center a rack in the oven and preheat to 200 (F). Preheat your waffle maker according to the manufacturer's instructions. In a large bowl, whisk together 1 cup buttermilk, 3/4 cup reduced Tree Top 100% Pure Pressed Sweet and Tart Apple Cider (from the first step) 1/4 cup melted unsalted butter, and 2 large egg yolks until combined. Use a rubber spatula to mix in 2 cups all-purpose flour, 1 teaspoon ground cinnamon, 1 teaspoon baking soda, and 1/2 teaspoon kosher salt. In a separate medium bowl, use a handheld electric mixer to whisk 2 large egg whites into soft peaks. Use a spoon to carefully scoop the egg whites into the flour and buttermilk mixture, being careful not to deflate the egg whites. Use a rubber spatula to fold the egg whites into the mixture until the waffle batter is light and homogenous. Cook the waffles in the preheated waffle maker, using the necessary amount of batter and time recommended by the manufacturer until golden. 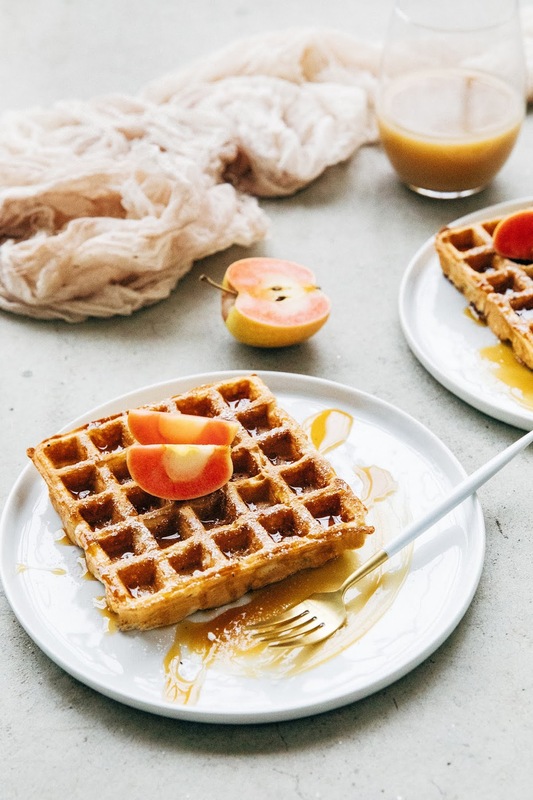 As the waffles finish cooking, transfer to the preheated oven to keep them warm while you finish cooking the rest of the batter; place each waffle directly on the oven's middle rack. Serve immediately with fresh apple slices, maple syrup, and confectioners' sugar. Enjoy!